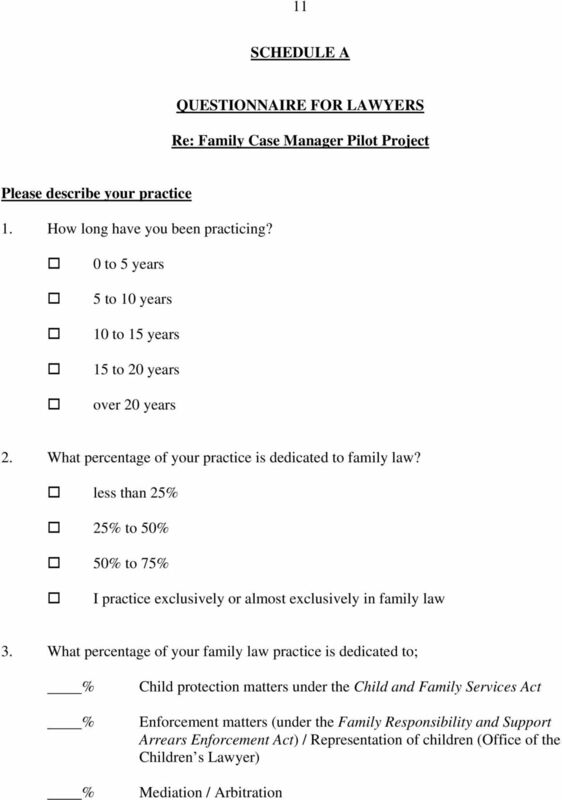 Download "EVALUATION OF THE OTTAWA FAMILY CASE MANAGER PILOT PROJECT- YEAR ONE"
2 2 EVALUATION METHODOLOGY The following methodologies have been adopted for the purpose of evaluating the Pilot Project: 1. Collection and analysis of questionnaires to be completed by members of the Bar on an annual basis 2. Collection and analysis of questionnaires to be completed by the Masters on an annual basis 3. Collection and analysis of questionnaires to be completed by members of the Bench on an annual basis 4. 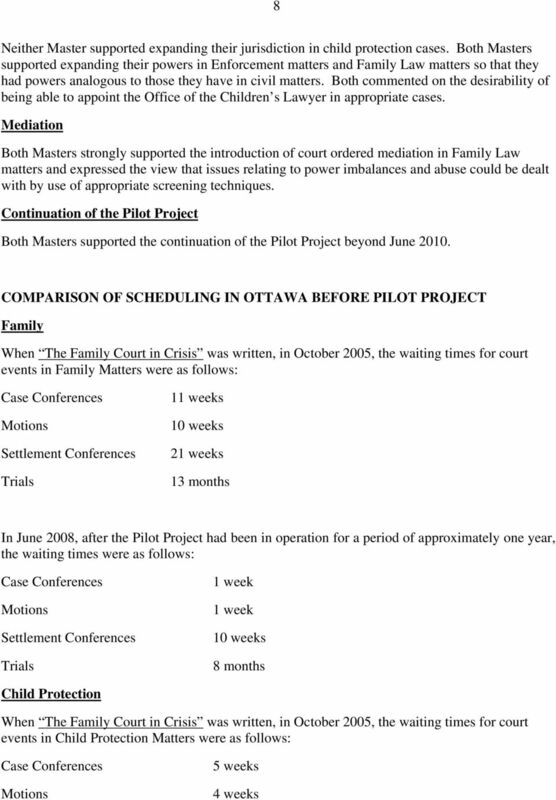 Comparison of scheduling of various court events in Ottawa before the commencement of the Pilot Project with the scheduling of the same events in Ottawa during the term of the Pilot Project 5. 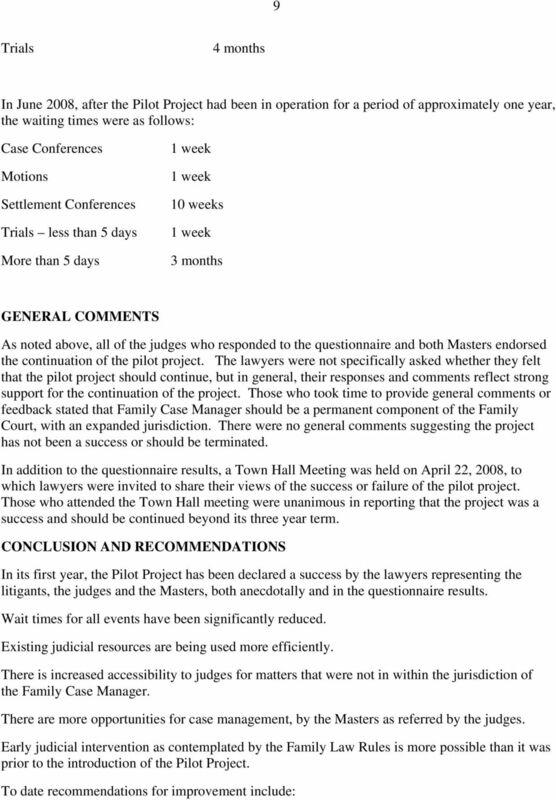 Anecdotal evidence collected at Town Hall Meeting and from comments in questionnaires QUESTIONNAIRES COMPLETED BY MEMBERS OF THE BAR A copy of the questionnaire completed by members of the bar in June 2008, after one year of the Pilot Project, is attached as Schedule A. A total of 49 questionnaires were completed and submitted. The results are summarized on the chart found at Schedule B. 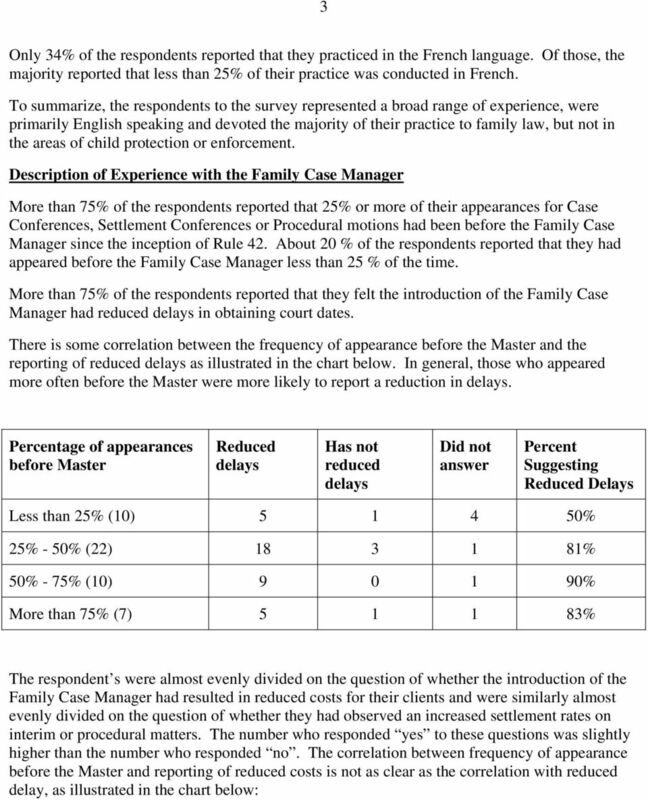 Description of Practice of Respondents The respondents were evenly distributed amongst junior and senior practitioners with roughly 40 % of the respondents having been in practice less than 10 years and roughly 45% of the respondents having been in practice for more than 15 years. The remaining respondents had been in practice for between 10 and 15 years. More than 83 % of the respondents reported that family law made up more than 50% of their practice and close to 60 % of the respondents reported that family law made up more than 75 % of their practice. Most of the respondents reported that child protection, enforcement and mediation made up less than 25% of their practices. Only 4 to 12% of the respondents reported that any of these areas made up more than 25% of their practice. Over 18% of the respondents reported that they did not practice in these areas at all. More than half of the respondents reported that more than one half of their cases require and court action or application. 10 10 1. Increasing the jurisdiction of the Family Case Manager to include the appointment of the Office of the Children s Lawyer. 2. Simplifying the drafting and structure of Rule 42 so that it is more easily understood 3. Consider the introduction of court ordered referral to mediation. Monitoring should continue on an annual basis for the balance of the term of the Pilot Project. 12 12 4. What percentage of your family cases require a court action/application? less than 25% 25% to 50% 50% to 75% more than 75% 5. What percentage of your family practice is in the French language? I do not practice in French less than 25% 25% to 50% 50% or more Describe your experience with the Family Master 6. 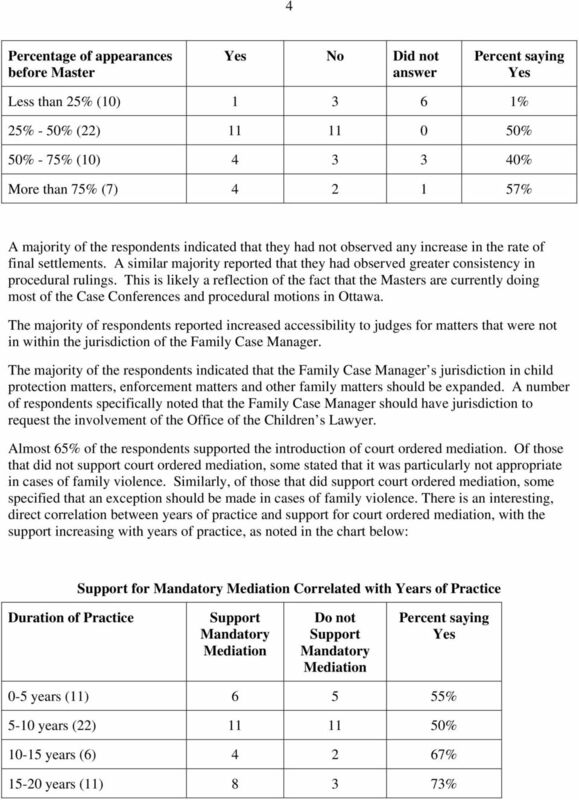 Since the introduction of Rule 42 and the Family Master Pilot Project in Ottawa (in June 2007*), what percentage of the Case Conferences / Settlement Conferences / Procedural Motions you participated in have been before a Family Master? less than 25% 25% to 50% 50% to 75% more than 75% 7. 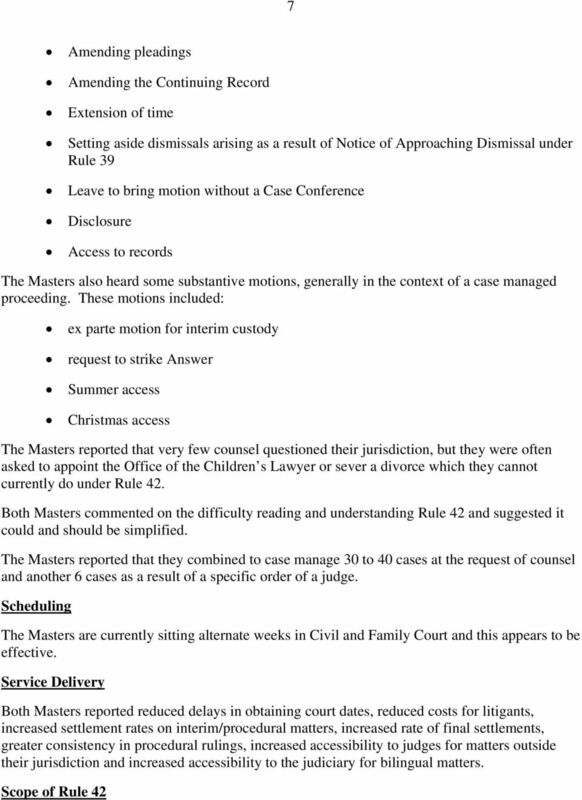 Do you feel that the introduction of the Family Master has altered the delivery of services to family clients in the following aspects: a. reduced delays in obtaining a court date? yes b. reduced costs associated with Family Master s yes ability to case manage court actions? 13 13 c. increased settlement rates on interim/procedural yes matters? no d. increased rate of final settlements? yes e. greater consistency in procedural rulings? yes f. increased accessibility to judges (for matters that yes are not within the jurisdiction of the Master)? g. increased accessibility to judiciary for bilingual yes litigants? no I do not practice in French h. Any other aspects? (Please describe) 8. Would you support expanding the Family Master s jurisdiction (powers) in the following areas: a. Child protection (CFSA)? no yes Are any additional powers necessary for the Family Master to effectively deal with these matters? b. Enforcement matters (FRSAEA)? yes Are any additional powers necessary for the Family Master to effectively deal with these matters? 15 Do you feel that the Family Law Information Center (FLIC) is assisting in the efficient delivery of services to family litigants? yes no Please indicate why or why not: General Feedback 13. 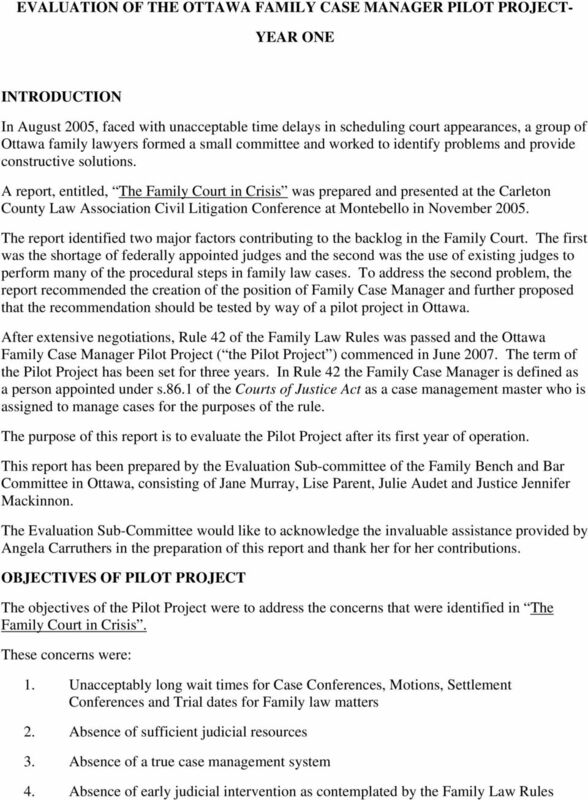 Do you have any suggestions or comments regarding the Family Case Manager Pilot Project in Ottawa? 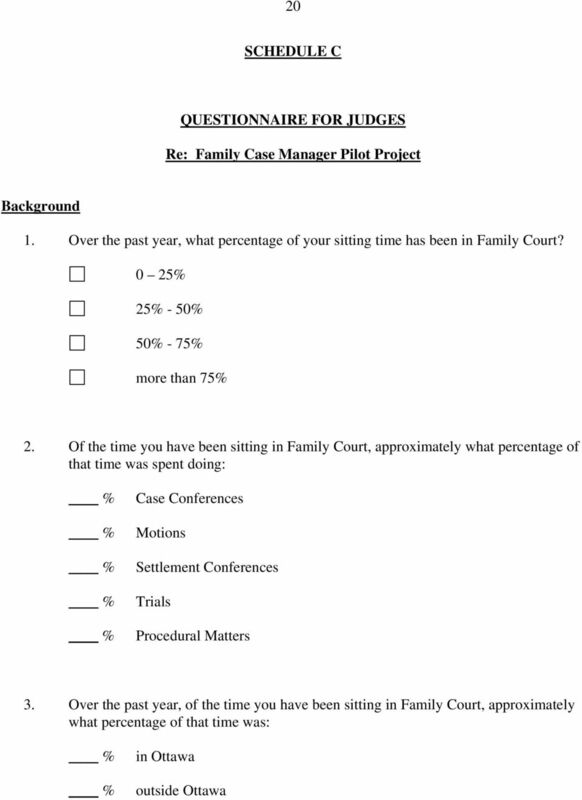 16 16 SCHEDULE B Summary of Responses in Questionnaires Completed by Members of the Bar QUESTION RESPONSES 1. How long have you been practicing? 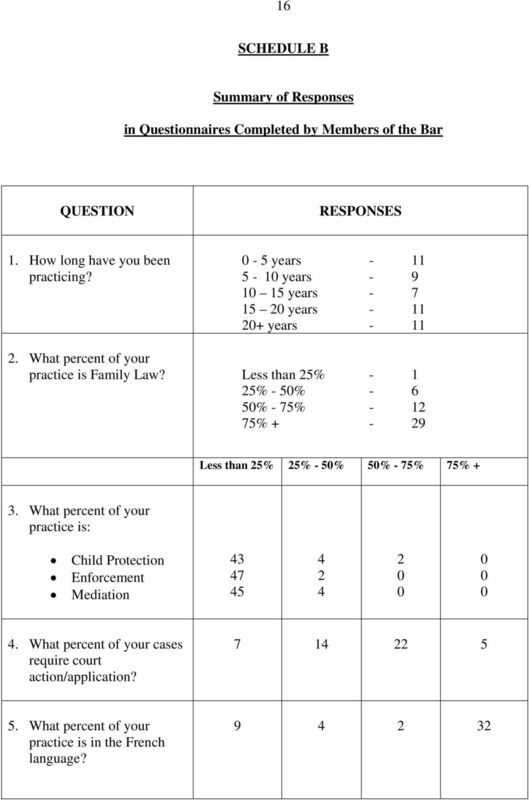 0-5 years years years years years What percent of your practice is Family Law? Less than 25% % - 50% % - 75% % Less than 25% 25% - 50% 50% - 75% 75% + 3. What percent of your practice is: Child Protection Enforcement Mediation What percent of your cases require court action/application? What percent of your practice is in the French language? 19 19 YES NO NO RESPONSE 12. Do you feel that the Family Law Information Centre (FLIC) is assisting in the efficient delivery of services to family litigants? 23 23 Jurisdiction of Family Case Manager 6. Over the past year, while sitting in Family Court in Ottawa, have you been asked to overrule or vary any Order of the Family Case Manager? 1-5 times More than 5 times Never 7. Have you had occasion to refer a case to the Family Case Manager for case management or a reference? 1-5 times More than 5 times Never 8. Would you support expanding the Family Case Manager s jurisdiction (powers) in the following areas: (a) Child protection (CFSA)? yes If yes, what additional powers would you recommend for the Family Case Manager? (b) Enforcement matters (FRSAEA)? 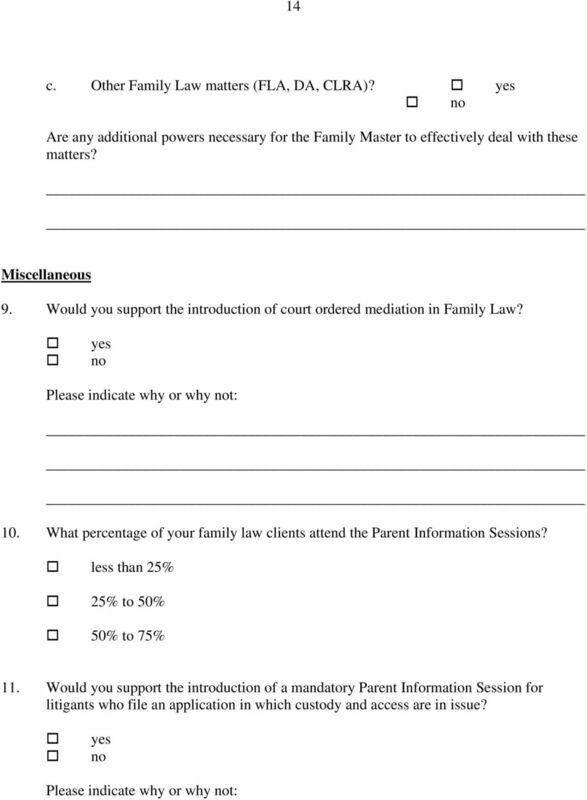 yes If yes, what additional powers would you recommend for the Family Case Manager? (c) Other Family Law matters (FLA, DA, CLRA)? 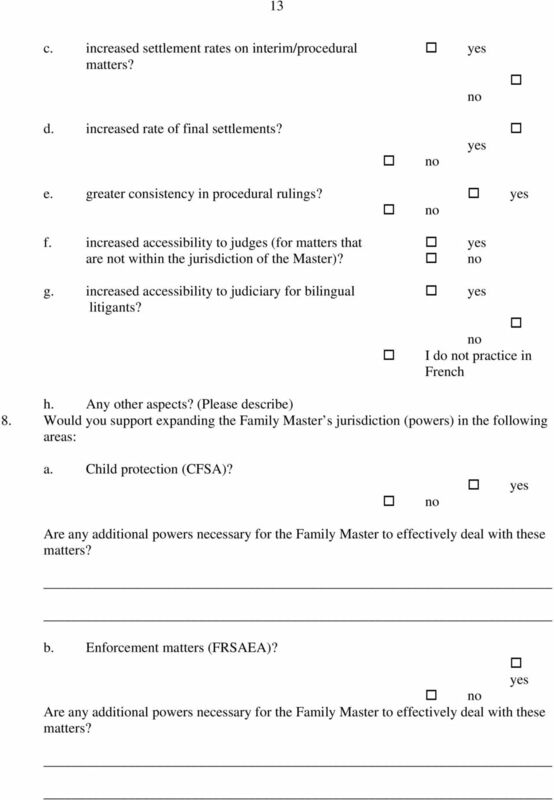 yes no If yes, what additional powers would you recommend for the Family Case Manager? 24 24 Miscellaneous 9. Would you support the introduction of court ordered mediation in Family Law? yes Please indicate why or why not? General Feedback 10. Based on your experience to date, should the Pilot Project bet continued beyond June 2010? yes no 11. 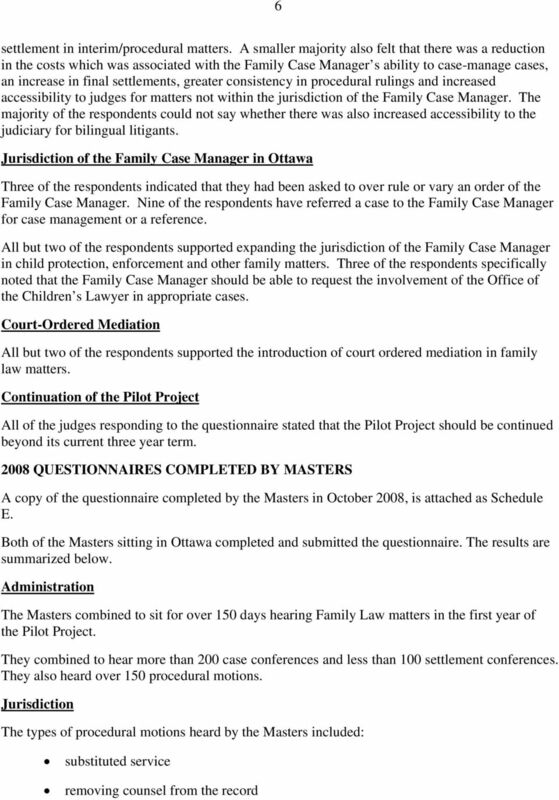 Do you have any suggestions or comments regarding the Family Case Manager Pilot Project in Ottawa? 32 32 Jurisdiction of Family Case Manager 12. 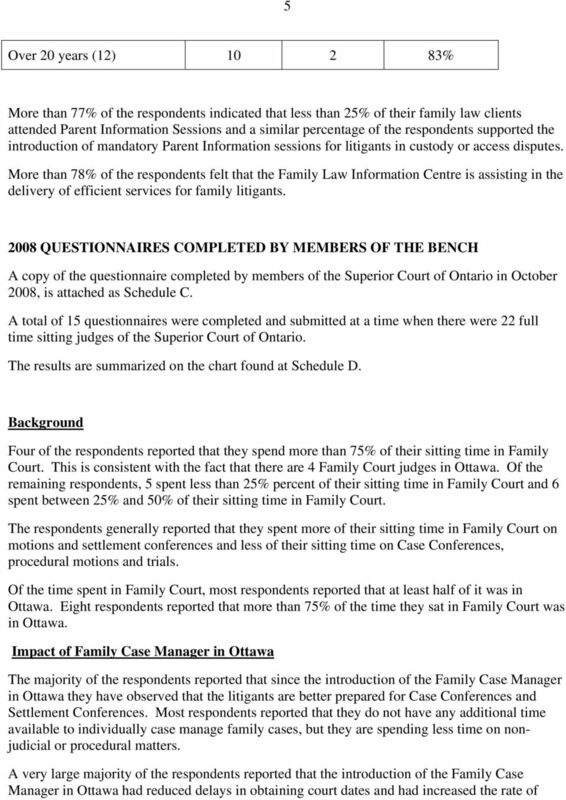 Over the past year, while sitting in Family Court in Ottawa, have you been asked to overrule or vary any Order of the Family Case Manager? 1-5 times More than 5 times Never 7. Have you had occasion to refer a case to the Family Case Manager for case management or a reference? 1-5 times More than 5 times Never 8. Would you support expanding the Family Case Manager s jurisdiction (powers) in the following areas: (a) Child protection (CFSA)? yes If yes, what additional powers would you recommend for the Family Case Manager? (b) Enforcement matters (FRSAEA)? yes If yes, what additional powers would you recommend for the Family Case Manager? (c) Other Family Law matters (FLA, DA, CLRA)? 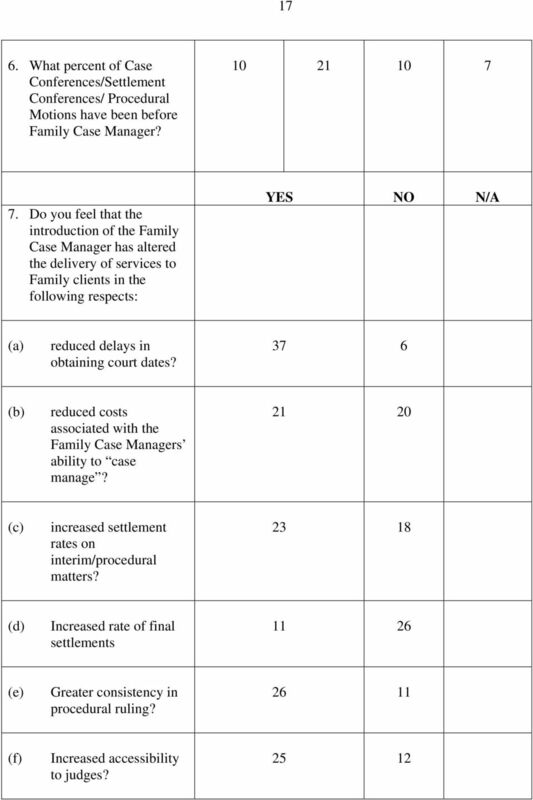 yes no If yes, what additional powers would you recommend for the Family Case Manager? 33 33 Miscellaneous 9. Would you support the introduction of court ordered mediation in Family Law? yes Please indicate why or why not? General Feedback 10. Based on your experience to date, should the Pilot Project bet continued beyond June 2010? yes no 12. 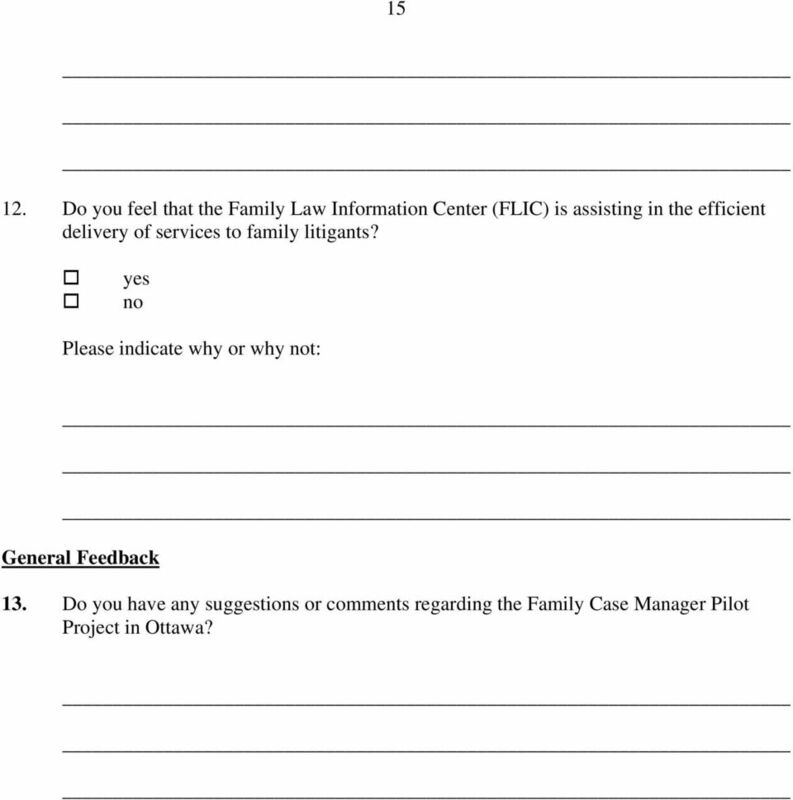 Do you have any suggestions or comments regarding the Family Case Manager Pilot Project in Ottawa? MEDIATION Texas Family Code 6.602. MEDIATION PROCEDURES. (a) On the written agreement of the parties or on the court's own motion, the court may refer a suit for dissolution of a marriage to mediation. Case Name: D.v. D. Between D.D., applicant, and A.D., respondent. O.J. No. 1308. 138 A.C.W.S. (3d) 490. Newmarket Court File No. Court of Queen s Bench of Alberta Edmonton Family Law Town Hall Meeting June 13, 2012, 1:00 p.m. Edmonton Law Courts Building Courtroom 317 In Attendance Associate Chief Justice J.D. Rooke Justice B.A. Small Claims Court What is Small Claims Court? Inside this guide: Introduction What kinds of cases go to Small Claims Court? How much will it cost me to make or defend a claim in the Small Claims Court? In January 2009, Judge Smith became board certified as a Family Law Trial Advocate by the National Board of Trial Advocacy.